Usually, when moving to a new place, there is the excitement of setting up one’s living space as suits. Unpacking, finding new homes for treasured things. The wonderful feeling of getting settled. That didn’t happen in the move up here, October 2011. The whole thing was rushed, complex, fraught with last minute disasters. The first morning, I recall, was really sweet as we had friends helping and I made a huge breakfast and, for a little while, I managed to get my hands on that feeling of adventure and fun, setting up a new home with my partner and kids. I never really nested, though. That settledness didn’t ever happen properly. Things were never in their right places. Everything felt off, like a chair you really want to sink into, that looks so comfortable, but it just won’t let you. 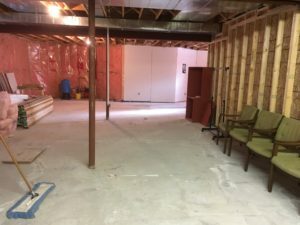 Rooms kept getting re-arranged. Boxes became like furniture – still packed – and just sitting there. Much of the last year then, the fun of it, has been the nesting. Every week, sometimes every day, sees some new minor improvement that advances the settling cog one or two notches further. Today I had a couple of nice local teens, looking for Christmas money, help me for a couple of hours. 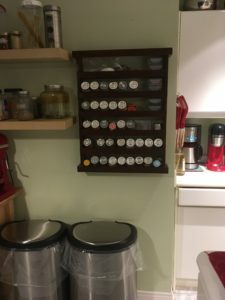 As a result, just today, I have a linen cupboard placed where I can use it, my spice rack (lo these five years not installed after I paid a mint to have it custom made for my condo) finally installed where it belongs, and a basement that looks … amazing! I’m busy creating a workshop in the garage so I can really get going on the nesting. So many fun projects on my list. 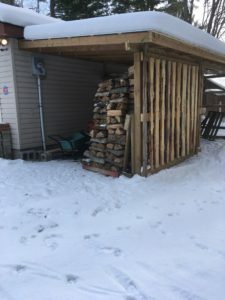 To reclaim the garage, I’ve had a structure built to house firewood and, when fully finished, to be a tool shed. This will keep firewood and larg e implements out of the garage so I can start to settle there, too. I have other things I probably should be doing. But the force to reclaim this space is strong in this one, so to speak. I feel like I can’t start my “next big thing” until I’m done this series of smaller things. Today, It Is All About The Light Click Here To Comment! Today seems to be all about the light. I have just pulled away from having my headlight bulbs replaced in my car as they were inadequate for deep, dark, rural nighttime driving. While that was being done, I managed to find a powerful rechargeable spotlight/flashlight on sale which will allow all of us to go owling in our deep, dark, rural winter evenings. As I’m driving into the city this morning, it feels like a beautiful spring day although, in fact, it is a beautiful January day. The quality of the light hitting the vistas before me makes the world seem to glow. This type of day reminds me of the kind of spring day I remember growing up on the farm, with the sun thawing out the soil. You can smell everything loosening up and getting ready to grow. I loved this kind day as a child and I’m looking forward to experiencing this yet again when real spring hits in a few months. Today is also about the light because I am on my way to a funeral. We have lost a bright and beautiful colleague to cancer and it has taken us all a bit by surprise. Although I didn’t know her well, Sue struck me as being one of the most positive people I know at work. She was upbeat, always, and the picture of health and wellness. Most of our conversations revolved around diet, exercise, living well and loving life. It is a bit of a shocker that cancer claimed her so quickly and completely. It feels important to respect and acknowledge this very bright light having left our particular corner of the world although, knowing Sue even the little bit that I did, I don’t think she would be interested in having us wander around in despair. I think she would want us to have a glass of wine, a good meal and a good dance party. This light we have lost makes me reflect on the kind of legacy that I might be leaving behind one day, hopefully far in the future. I pause to wonder whether everything I’m putting the world is as positive and as straightforward as it could be. I wonder if I allow my inner demons to shout down my better angels. I fear that the answer, all too often, is “yes”. I over-think things, I over-analyze, and I make situations far more complicated than they need to be. I get lost in it sometimes, as one might in a deep, dark, rural night without good headlights or a decent flashlight. I don’t think it is possible for me to be a relentlessly positive and cheerful person, and I think my analytical skills are valuable at times, yet I think I can do better at not getting so lost. At curbing my tendency to wallow with my demons rather than celebrating with my angels. Although I didn’t make specific New Year’s resolutions, I am going to take this opportunity to commit to dancing more and wallowing less. To celebrating that which is right in my world rather than highlighting that which is not right. To remembering that light exists, somewhere, even when I’m lost in the dark.